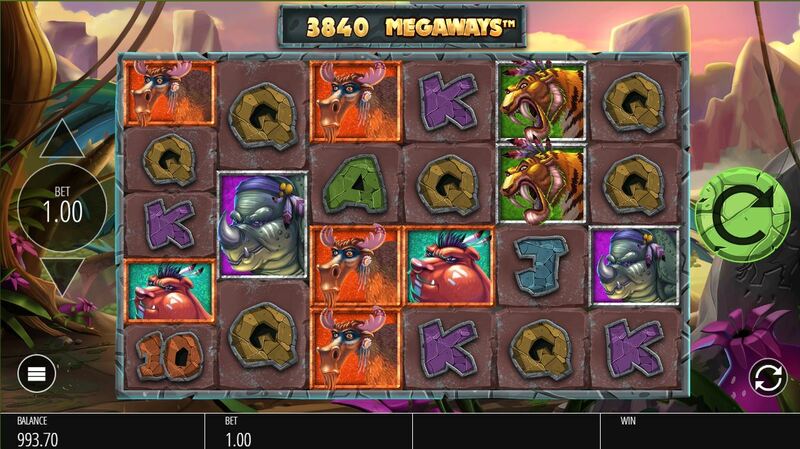 Primal Megaways slot is yet another Blueprint use of the Big Time Gaming Megaways license seen in slots such as Bonanza. Blueprint are releasing many of these lately and Primal comes hot on the heels of Diamond Mine, Irish Riches and Genie Jackpots. Here we have a primeval theme with a prehistoric jungle in the background and dinosaurs featuring on the reels, spinning to some dramatic drum-based music with mighty roars when wins appear. Primal certainly thus catches your attention both visually and aurally, but will we see a mammoth effect on our bankroll here? 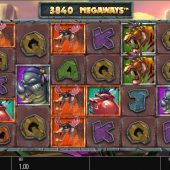 This version of Megaways Primal slot uses is different from the usual 117,649-way games, because they have up to 7 rows available on each reel and here we get just 6 as the maximum therefore a possible 46656 ways to win over our 6 reels. Symbols appear stacked and singly with the Mammoth the top pay at 50x bet for 6-of-a-kind, Sabre-Toothed Tiger 5x, Dragon 2.5x, Pig Or Elk 2x with card values at either 1 or 0.5x bet for a full way of 6 icons. You will see scattered bonus symbols on all reels and instead of being above the reels, Wilds appear in the grid only on reels 2 to 6 but can appear in pairs. These take the form of a dinosaur footprint and have a huge effect if we trigger the feature! As with Blueprint's Diamond Mine you also see stacks of mystery icons spinning on the reels, in this case Fiery Caves which will all reveal the same icon if landing in view. Primal is really all about the bonus though. Right, this is quite straightforward but can be utter madness! For 3 scatters you get 10 free games where the Wilds in view offer either a 2 or 3x multiplier if enacted, just like Buffalo and Raging Rhino. You won't see any more than one on a reel now though and therefore for hitting them all on reels 2 to 6 you could get up to 243x mutliplier awarded. You can retrigger them and not only that, get 5 extra spins for just two in view. 4-scatters means 15 spins with 2 to 4x on any Wilds. This can therefore produce a 1024x multiplier for all 5 Wilds on 4x. 5-scatters awards 20 free spins with, you've guessed it, a 2 to 5x multiplier for Wilds so a best possible 3125x multiplier. 6-scatters 30 free games with 2 to 6x for Wilds therefore a best of 7,776x is feasible. I told you it was madness! Oh, and I forgot - you get a Bonus Guarantee but not like the WMS Rhino one you may be familiar with. In this case you get 10 extra spins if your bonus fails to get to 10x bet. So with the normal 3-scatter trigger it's effectively a guaranteed retrigger. I like that idea. Given that Primal slot has just about everything right with great sounds and animations plus a very good 96.76% RTP along with big-win potential in both base game and especially the feature, you'd expect a favourable conclusion, right? Actually no. This is because the game is capped on any spin, including bonus round totals, at 50,000x bet OR 250,000 whichever is reached first. So it is possible to get 3 Mammoth on reel 1 with a 7776x multiplier which would pay in excess of 1.16 million x bet on a maximum 5 stake. Therefore the maximum stake player would be relieved of around 5.25 million of their 5.6m winnings in this scenario, the 20-coin minimum player 190,000 of his 200-odd thousand winnings. This means that the big results that seem possible on the reels must all be registered in the RNG pool as 50,000 bet only otherwise the game wouldn't work fairly over time. This begs the question:- what is the point of this mechanic? ?